China Kicks Off 'Great Leap Forward' On The Soccer Field : Parallels China is rolling out an ambitious soccer program. President Xi Jinping is reported to be a big fan who wants China to win a World Cup. Critics say there's too much emphasis on quick results. 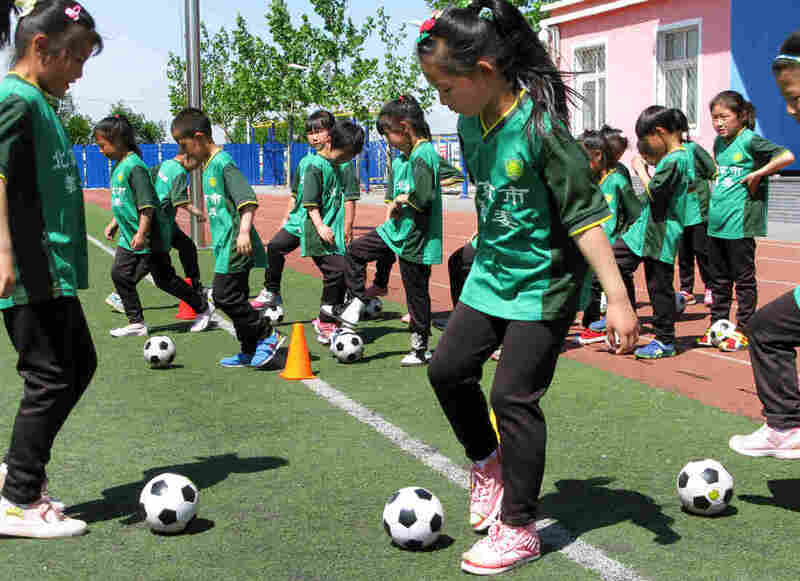 First-graders take soccer class at the Nandulehe Elementary School in suburban Beijing. The school is one of 20,000 that's launching a national soccer curriculum in the next five years. It's part of a government plan to raise China's soccer skills and eventually, China's leaders hope, host and win a World Cup. 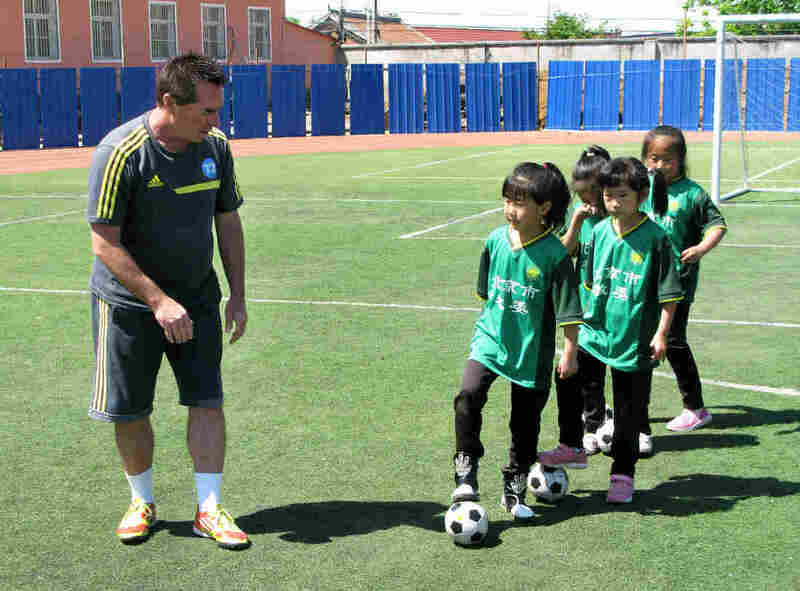 At an elementary school outside the Chinese capital, Beijing, first-graders practice controlling soccer balls under the instruction of American coach Tom Byer. "When I clap, everybody's going to dribble to the circle, pull it back and go to the right. Go!" he says. Regular soccer balls would practically come up to the kids' knees, so they practice with miniature ones instead. But Byer, a native of New York, argues that even at age 6 or 7, the children are already late to the game. In countries that excel at soccer, Byer says, "the kids get a tremendous head start, because from the day that they can walk, they've got a ball at their feet." "Grass-roots soccer development is a marathon. It's not a sprint." If he seems a bit demanding, it's because Byer faces a daunting task. The Chinese government has hired him to help with an ambitious plan designed to build China into a soccer powerhouse. The plan calls for a national soccer curriculum to be introduced in 20,000 schools nationwide in the next five years. Much of the impetus for the plan appears to come from China's highest-ranking soccer fan, Communist Party boss and President Xi Jinping. Part of Byer's task is to make it clear to his employers that there are no shortcuts to soccer glory. "You have to manage expectations, first of all," says Byer, who has advised soccer federations and governments around the world. "Grass-roots soccer development is a marathon. It's not a sprint." Then, China must develop a national pool of soccer talent, one child at a time, and an environment that fosters their talents. "There are only eight countries that have ever won a World Cup," Byer points out. "And they're the same repeaters every single time, and it comes down to one really important word: culture." Those countries include Uruguay, which has a tiny fraction of China's population and economy. Byer's prescription calls for educating soccer moms, dads, aunts and uncles to help the kids along. And he advises China to worry less about its professional teams and for starters focus on winning in the soccer youth leagues. China had an earlier plan to boost national soccer performance in the 1990s. China managed to make it into the 2002 World Cup but failed to score a single goal. China's dismal performance has long been a sore spot, if not an unbearable humiliation, to the country's legions of fans. The drafters of China's latest soccer master plan also asked Beijing-based sports promoter Wang Qi for his advice. He says their questions revealed a lot. "Their first question was 'What method can we use to raise China's soccer level in the shortest amount of time?'" he recalls. "Their question shows that they're in a big hurry to get quick results." He believes this may be related to something that's been widely reported: Xi Jinping wants his country to host and win a World Cup. Wang says the Chinese leader's love of soccer stems from his early years as a worker and grass-roots party cadre. On a visit to Los Angeles in 2012 — during his first year as president — Xi was given two signed jerseys, Wang points out. One was from the LA Lakers' Kobe Bryant. The other was from David Beckham, then in his final season with the LA Galaxy. Wang isn't optimistic about the government's soccer plan, which he thinks is "unscientific." He says he finds officials' extreme enthusiasm for the plan a bit fishy. "Many Chinese officials' biggest problem is that they only know how to fawn on their superiors," Wang says. "Xi Jinping likes soccer, the leadership wants to develop it, so they all rush to build soccer fields. They have no concept of governing for the people." The plan does seem to be generating some feverish financial speculation. The stocks of nine companies with connections to China's soccer league have rocketed an average of 158 percent since the government's plan was announced last year. Wang describes the plan as the sporting equivalent of the "Great Leap Forward." Chairman Mao's 1958-1961 drive to overtake the U.S. and the U.K. in industrial production ended in a massive famine that killed tens of millions of people. The earliest China is likely to have a shot at hosting the World Cup is 2026 or 2030. How long it could take China to win one is unclear. Xi Jinping has eight more years in office.